UROC head honcho Ranch Pratt had both an easier and harder time coming in to the second RockCross event of the season. 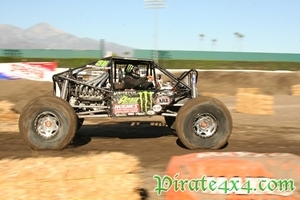 On one hand, Pratt was guaranteed a larger crowd than at the first event in Salt Lake City, as the Pomona event was held in conjunction with the Off Road Expo. 40,000 people come to the Expo and UROC cannot help but capture the attention of at least some of them. On the other hand, expectations would be higher and logistics would be much more complicated. With only 18 competitors in Salt Lake City, the event was not completed until midnight. What would happen with 26 competitors threw their hats in the ring in Ponoma? 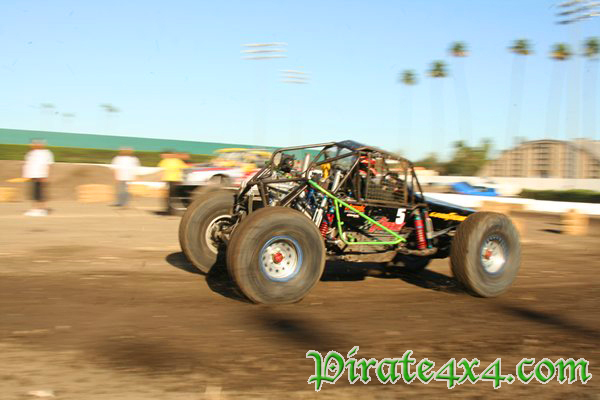 Pirate4x4 headed to Southern California determined to answer this, and many other questions. 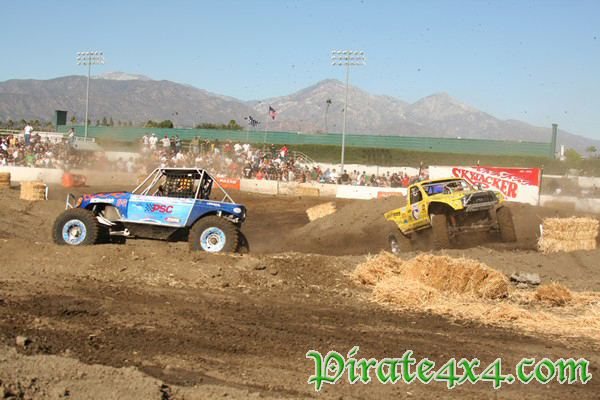 The first thing that we noticed was that unlike last year, the RockCross was held on the back forty at the Fairplex. UROC constructed a course on the horse track at the far end of the fairgrounds next to the FJ Cruiser Ride-and-Drive event, but far from the semi trucks and toterhomes full of trophy trucks and scantily clad women on display at the Off Road Expo. Additionally, there were few signs or announcements informing the throngs of potential fans about the RockCross. As a result, the spectator turnout was light during the qualifying laps on Saturday morning, but increased as the weekend went on. Although the crowd was light, the breakage was not. Numerous teams suffered mechanical failures during the time trials before the actual event even began! Rick Deremo sheered his right front wheel studs, Brad Lovell lost a transmission seal, and Joachim Schiewsow bent his front axle. With the RockCross held just days after the XRRA Finals, t at least some of the breakage could be attributed to fatigued parts from the previous weekend. Lady luck was no kinder to the competitors once the main event started. After posting the fast time in the Stock class qualifying, Pistol Pete Sohren broke a ring and pinion in the rear of Dan Patterson's CJ-7 during the first race of the day, allowing Troy Bailey to advance. 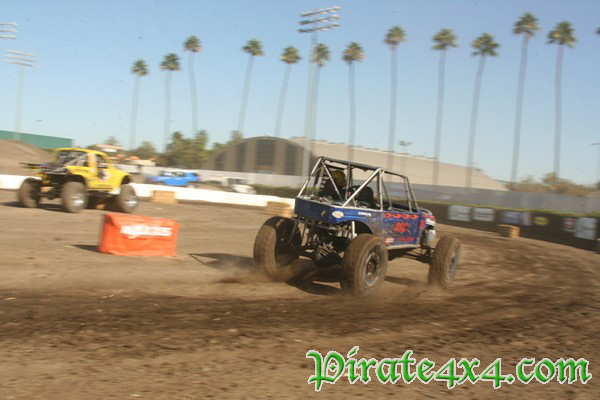 Buzz Bronsema won the second heat when Kathy Crook and Renee Lebaron both rolled their Jeeps. 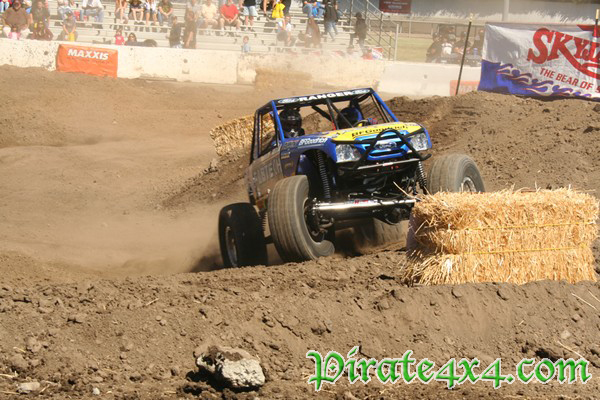 The carnage continued in the modified class, where RJ Brown dropped out of the first race with steering troubles. Steering would be a reoccuring theme for numerous teams throughout the weekend.. Karl Nielson and Dean Bulloch kept up a good race after Brown dropped out, with Bulloch winning after four full laps. This was impressive considering that Bulloch had broken ribs and was driving a vehicle borrowed from fellow Cedar City resident Shon Williams. The "Iceman" has a reputation for being a slow, technical driver behind the wheel of his manual transmission Samurai, but as with Pistol Pete, Bulloch's natural driving ability translated well to RockCross. Another Bulloch, Steve, won the second Modified race against Clay Egan and Brad Lovell after Lovell suffered a steering failure. Jimmy Mabey was beating RockCross newcomer Weston Blackie in the final Modified race of the first heat when he came too fast into a corner, rolling over on to his lid. Mabey suffered a first round defeat in the Salt Lake City RockCross event though and came back to win, so we knew better than to count him out. 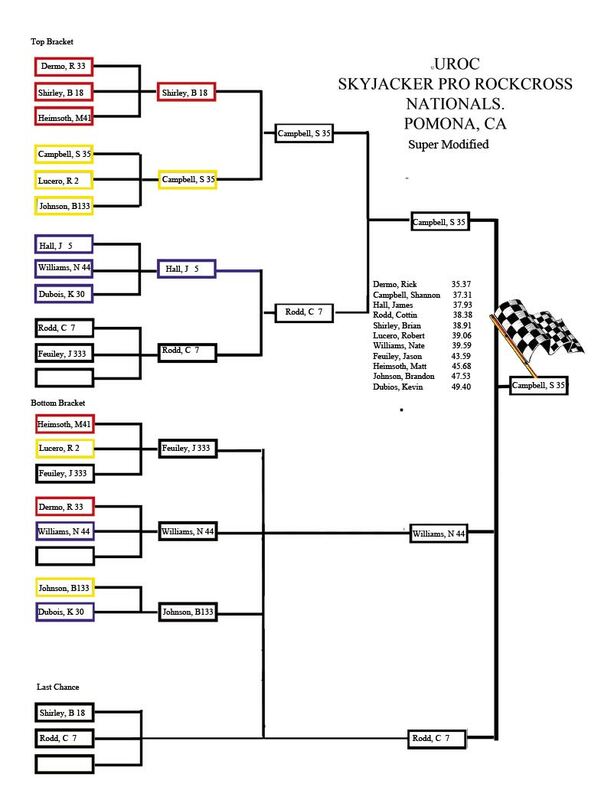 Unlike the first event at Rocky Mountain Speedway, the action in Pomona seemed to move at a steady pace. Ranch Pratt did a better job of preparing teams at the starting line and disabled vehicles were quickly moved off of the course to keep the event flowing. 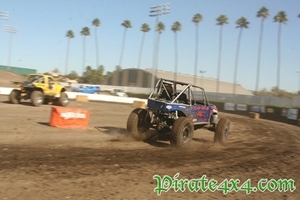 The RockCross races were broken up in to two hour chunks throughout the weekend in order to let spectators enjoy the rest of the Off Road Expo, and this also allowed competitors to patch their vehicles back together between heats. Speaking of heat, a water truck was used to keep the dust down on the makeshift track, and doing so dramatically altered the course at times, particularly the steep gunite climbs where traction became an issue. Rick Deremo got his issues from qualifying sorted out and had lane choice in the first Super Modified race after posting the fast time, ahead Shannon Campbell by a full two seconds. The talented rock racer demonstrated that he had was it takes to RockCross, but he lost another wheel and was out of the race on the second lap. Brian Shirley is another rock racer who knows about bad luck, he broke a Dana 60 axle clean in half at the XRRA Finals but managed to advance in his first RockCross after Deremo broke and Matt Heimsoth rolled on the final lap. 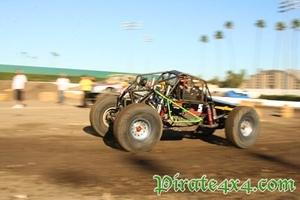 In the second race, Robert Lucero ripped the front axle out of his buggy on the first obstacle, which was a nasty vertical wall that claimed several victims. Shannon Campbell led the whole race to beat out Brandon Johnson. James Hall beat Nate Williams in the third Super Modified race after Kevin Dubois suffered a flat tire, and Cottin Rodd beat out Jason Feuiley in the battle of the Jimmy's 4x4-built buggies. At the end of the first day many competitors were broken and both winners from the Salt Lake City event had lost their first heat. The course was similar to the one used at Rocky Mountain Raceway, with a steep climb up the gunite followed by a drop back to the ground, after that was a smaller gunite wall, then a long sweeping lefthand turn, the last gunite wall, a tight S turn, and then a straight section over a huge roller that was framed by a giant inflatable Maxxis tire. Starting the second lap meant making a 180 degree turn once the tires settled back on to the ground. The sharp turns and high RPM seemed to be the biggest problem for vehicles designed for crawling, as both the S turn and the 180 quickly weeded out any competitors with steering or suspensions that were insufficient for high speed cornering. Hay bales and banners were used to mark the boundaries, and the course was slightly altered after the first day. This caused some confusion as not all competitors were aware of the issue when the green flag dropped. Racing on Sunday continued much as it had on Saturday, with brief glimpses of brilliance but most races won by the last vehicle running. 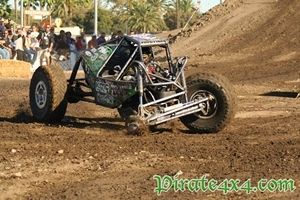 Perhaps when competitors start building vehicles specifically for RockCross the breakage will be less of an issue. 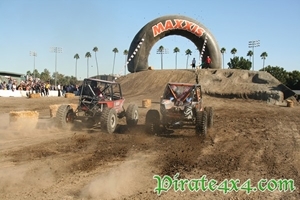 The Maxxis crew was able to replace the ring and pinion in the rear of the Jeep Pistol Pete was campaigning, and he fought back in the double eliminations to finish second in the Stock class behind Buzz Bronsema. 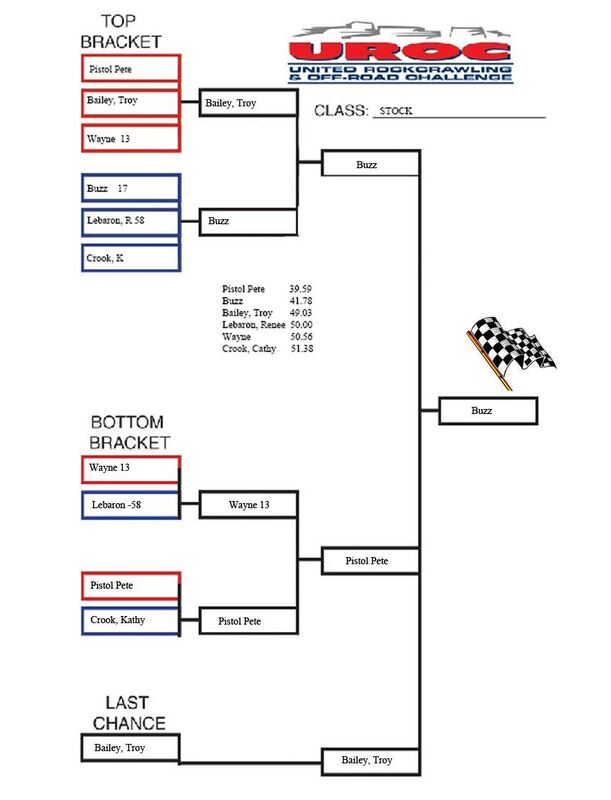 Brad Lovell fought back as well, fixing his steering issues to win from the bottom bracket. 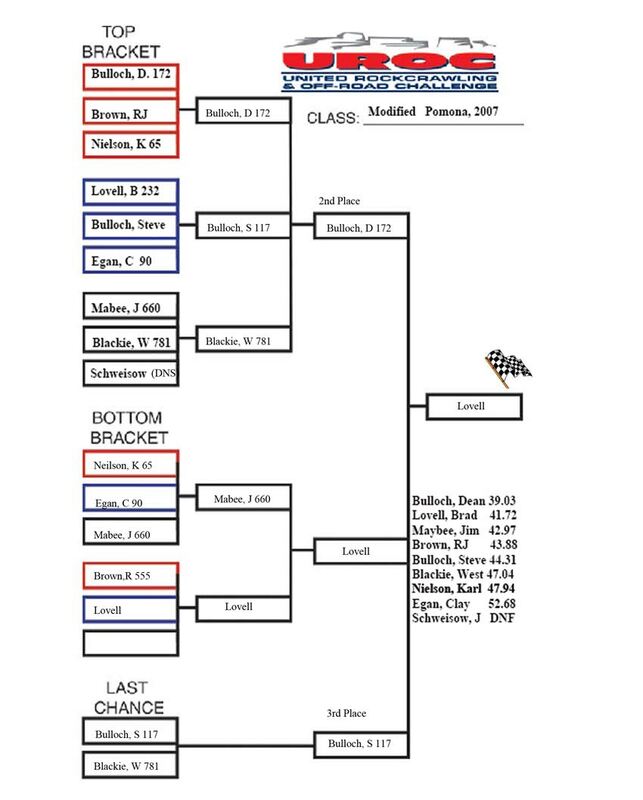 In doing so he had to beat tough competition from Jimmy Mabey in the semi-finals and Dean Bulloch in the finals. In the Super Modified class, Rick Deremo suffered the same fate in Pomona that Shannon Campbell had in Salt Lake City; he set the fast time only to lose both of his races due to mechanical failures and rollovers. Campbell, however, faired much better this time around. He won every race that he entered, leaving Cottin Rodd and Nate Williams to battle for second. Once the dust had settled, the series points race is tight in both Modified and Super Modified, with Jimmy Mabey, Roger Lovell, Shannon Campbell, Nate Williams, and Cottin Rodd all in the hunt for series wins. The grand finale for the event was a race that UROC dubbed the "Pure Adrenaline Cup", with six vehicles from various classes racing side by side. RJ Brown from Team Pure Adrenaline sponsored the race and the fans seemed to love it. "We have found that the qualifying times very similar for all classes" Pratt commented. Looking at the qualifying times confirmed Pratt's statement; the fastest Modifed time was in the middle of the Super Modified times, and even Pistol Pete's Stock qualifying time was in the same range. 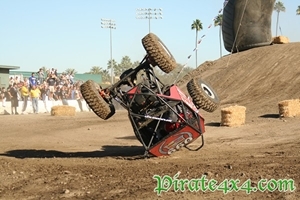 XRRA has run one all-inclusive class for years, recognizing that the moon buggies do not have a distinct advantage at speed. The Pure Adrenaline Cup pitted Karl Nielsen from the Modified class against Super Modified drivers Nate Williams, Rick Deremo, Brian Shirley, Brandon Johnson, and Shannon Campbell. Brad Lovell was asked to participate but declined due to his leaking transmission seal. 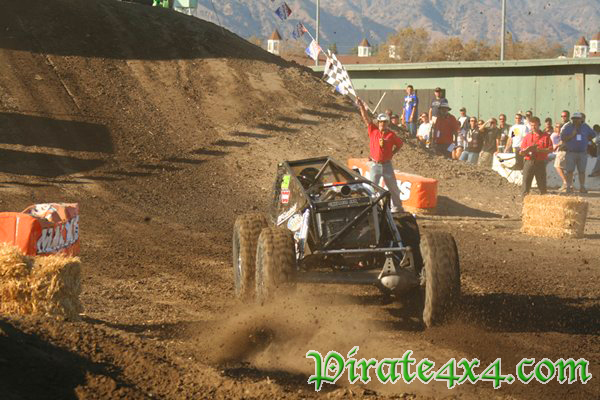 Campbell got the holeshot in his powerful, lightweight buggy and was able to maintain the lead for all four laps. This was by far the most entertaining race of the weekend, as all six competitors completed the race without rolling or breaking. Could this be a sign of things to come? 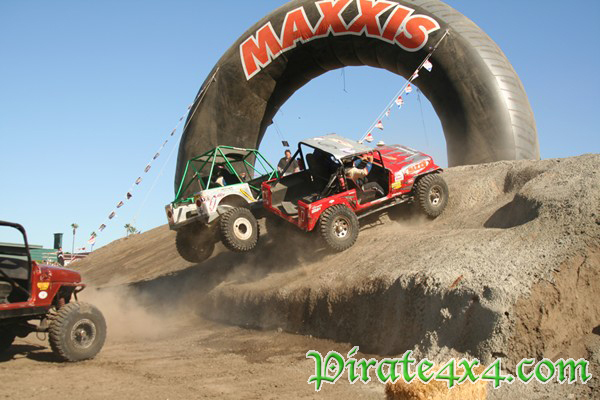 "We are experimenting with how many vehicles can safely run at one time" Pratt told Pirate4x4, "and the Pure Adrenaline Cup will definitely be back in Phoenix." At the end of the weekend Pratt hailed the event a success and predicted that the next RockCross would be the best one yet. "Competitors complained that the courses in Phoenix were too easy for rockcrawling" Pratt commented, "but they are wide and leave plenty of room for passing, so they should be perfectly suited to RockCross." 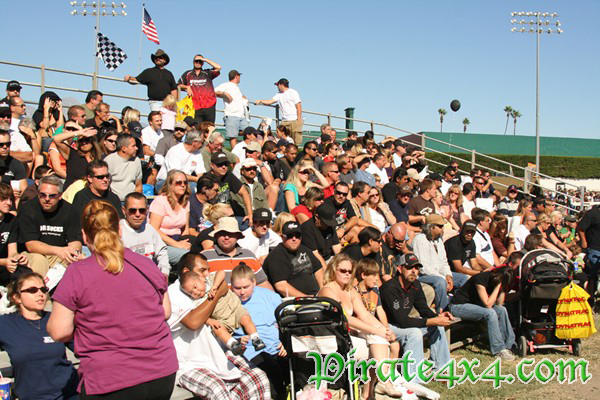 Even with ideal courses, will fans show up to a standalone event that isn't offered as part of a package deal, as was done with the racing at Rocky Mountain Speedway and Pomona's Fairplex? And will competitors show up in Phoenix without the allure of big money sponsors that the Off Road Expo presented? As usual, we walk away from another UROC event with more questions than answers.